See YouTube video - Game Principles. A Horns set for the 3-man (Gordon Hayward, who can shoot). They like to run it late in a game, there are multiple options, the point guard keys everything, what he does dictates how the play goes. Play to your strengths in creating an offensive set, get your two best players involved. 4 spaces out even if he isn't a 3-point shooter (he can step in on the flight of a pass), create space, even if it's artificially. 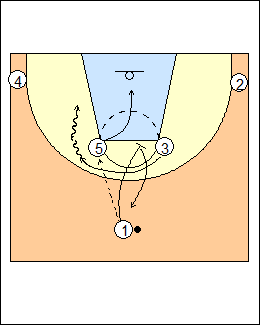 1 dribbles off 3's screen, 3 flies off a flarescreen from 5, 1 looks to pass to 3 or turn the corner. 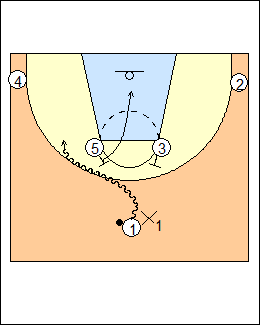 Most teams hedge or switch a small-small ballscreen, 1 has a chance to turn the corner if they hedge, and X3 might be late chasing over the flare. If they switch it, you would be surprised how often even NBA players make a mistake because they don't communicate (that's why they emphasize communication in this drill). If non-shooter 4 was in the right-hand corner, his defender might sag and stop 1 from turning the corner, and they would get nothing on a pass to the corner. With 4 in the other corner, X4 might sag off, that's fine, it's very difficult for him to stunt on a pass to 3. They set it up so X4 is down in the paint helping. See Horns - 1 wildcats, 1 Beltramo, Quick hitters - High and wing, Ravens 2015, also Offence - Severns 21 (Dribble). A lot of teams like to "weak" a pick and roll, sending 1 to his left hand. 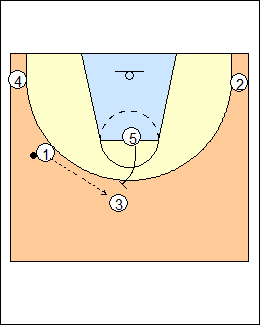 If they're "weaking", 1 comes off 5 who rolls to the basket, now they have two smalls on the right side of the floor (2 and 3), so the defenders who have to be in on the pick and roll are smaller players, and the offence has more of an advantage. 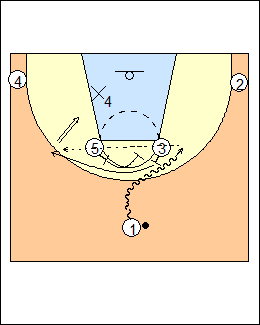 A lot of times what they have 5 do instead is go pin down for 3 (X5 is "down", icing the ballscreen). If 3 has no shot, 5 can come back into a pick and roll. If 1 throws it to 5, he pins down for 3, who comes off for a hand-off, turns the corner, 5 rolls, 1 pops back.